Raised on an Arizona ranch, O’Connor practiced as an attorney, served in the Arizona Senate, then as a superior court judge (1974–1979) and an appeals judge (1979–1981). 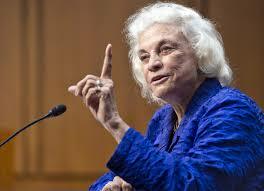 Nominated for the U.S. Supreme Court by President Ronald Reagan, she was sworn in on September 25, 1981. O’Connor served until she retired in 2006 (when she was succeeded by Samuel Alito) and was known for her moderate conservative orientation.